Our city really needs to crack down on the parking in the city streets after a storm. 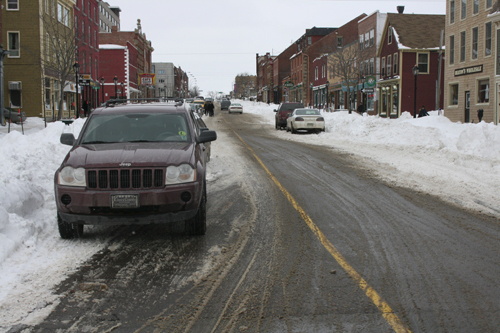 For instance, the following SUV is taking up most of the lane which forces drivers heading south on queen street to move into the other lane making this busy intersection on the corner of queen and water st a hazard. If you look at the tracks in the slush to the right of the SUV you will see how it forces people to the one lane. A couple weeks ago I seen a police officer ticket a truck whose rear end was on the street just a little bit after a storm.